There are a few variables you can use in custom PDF templates. [[Document_Title]] - The name of the document. [[File_Name]] - The name of the PDF file. [[Date]] - The date in the format that your system is configured to use. [[Date_Time]] - The date and time in the format your system is configured to use. [[YYYY-MM-DD]] - Year, month and date. [[YYYY-MM-DD HH:MM:SS]] - Year, month, date, hours, minutes and seconds. 24-hour clock. [[YYYY-MM-DD HH:MM:SS 12HR]] - Year, month date, hours, minutes and seconds. 12-hour clock with AM/PM. [[MM/DD/YYYY HH:MM:SS 12HR]] - Year, month date, hours, minutes and seconds. 12-hour clock with AM/PM. [[MM/DD/YYYY]] - Month, day and year. [[DD/MM/YYYY]] - Day, month and year. [[Page_Number]] - The page number. [[Page_Count]] - The total number of pages. Would be nice if HTML entities (like (r) or (c)) could be used. @Hans - you can just type the copyright symbol or registered trademark symbol directly into the fields in Clarify. Would be good to have a shortcode for just the year (something like [[YYYY]]) or more control over the date formatting. I would like to have the © followed by an updating year. @Keith - [[YYYY]] will be available in the next Clarify update. Would also be good to allow Creative Commons license icons/symbols for those of us creating documentation that we'd like to release openly. @Patrick - That format will be available in the next update. Is it possible to create a footer in three sections - left justified, centre and right justified? I'd like to have document title on the left, page number in the centre and date of creation on the right. Can this be done with a CSS div definition? If so, an example would be great. None of the date or time variables seem to work on the Mac version. The render simply prints the variable string. Ie, [[Date]] renders literally as "[[Date]]"
@Shawn - I just tested adding [[Date]] to the footer field and it worked on Mac. 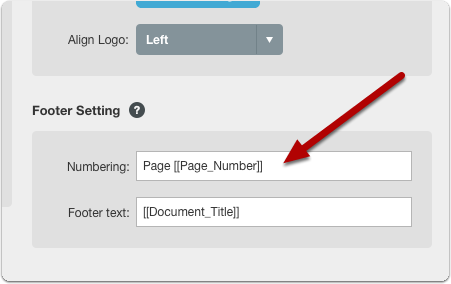 If you are putting the variable strings in the same fields as show in this article then maybe send your template to support@screensteps.com so we can take a look. Is it possible to add a "version" in the footnote which updates automatically like [[Date]]? @Svenja - not at this time. Is it possible to have different headers and footers for title and other pages? 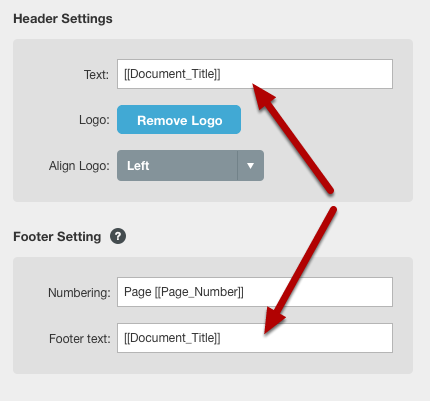 I'd like to have current header (logo + large text document title) and web address on title page with document title (body text or similar), aligned right, as header and copyright info and page number as footer on subsequent pages. Apologies if I've missed something obvious! How can I center the footer? @Trevor DeVore, thanks for the reply. I've added the following Custom CSS and it doesn't seem to be seeing it. It will look a little weird as the page number will still be on the right and above the footer text. If you hide the page numbering then it would work. Otherwise you are back to modifying the HTML to center things properly. @Trevor - Thanks, I appreciate the help. I understand what's happening now.